Ship “Brizo” in the spring of 2014 was transported from the german port of Barth. The vessel is fully optimized for fishing and festive activities. It’s an exciting, cool, cozy fishing for a small fishing company, business partners or family. We fully provide fishing equipment and bait. Fish and enjoy the freshest salmon carpaccio right on board! Fishing in the Curonian Lagoon. Depending on the season, we fish for horseradish, rye or redfish. When the water freezes in the Curonian Lagoon, Kaliningrad, we organize Perch ice fishing. We invite you to celebrate bachelor parties, birthdays, company holidays, weddings. Ship “Brizo” is an ideal solution for celebrating the most important holidays of your life on board. 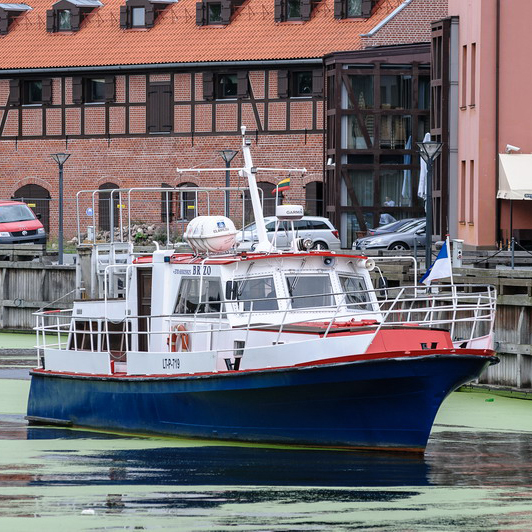 We sail up to 25 in the Curonian Lagoon and up to 12 passengers in the Baltic Sea. Klaipėda – Nida – Klaipėda and more.